I bought the boat in Long Beach but I intended to berth it in Moss Landing (between Monterey and Santa Cruz). That meant bringing it up the coast. Fortunately, my girlfriend Christine is quite salty (she's even been around Cape Horn on a tall ship) and was happy to come along. We had hoped to make the trip during the first week of January but the weather didn't cooperate and neither did my work schedule. The weather forecast started to look good so despite a somewhat problematic work schedule, we rented a car for a one way trip and got down to long beach on Saturday, January 12th. The trip up the coast can be kind of scary. We were going to be under way at night and possibly in thick fog so I wanted to have radar and GPS. Actually, given that I want to do some extended cruising on the boat, I'd want that stuff eventually ...plus I'm a geek and just plain like that sort of thing for it's sheer geekness. I had hoped to get everything installed and working on Saturday so we could be off on Sunday. Of course it didn't work that way. After much fuss and a trip to West Marine to get a different mounting bracket, I installed the Garmin GMR 18 radar on the mizzen mast, did a really janky job of running the wiring through the deck (as can be seen in the photo to the left), mounted the GPS antenna on the aft rail (I'd like to move it closer to the bow), mounted the chartplotter in the cockpit, and finally got it all working. 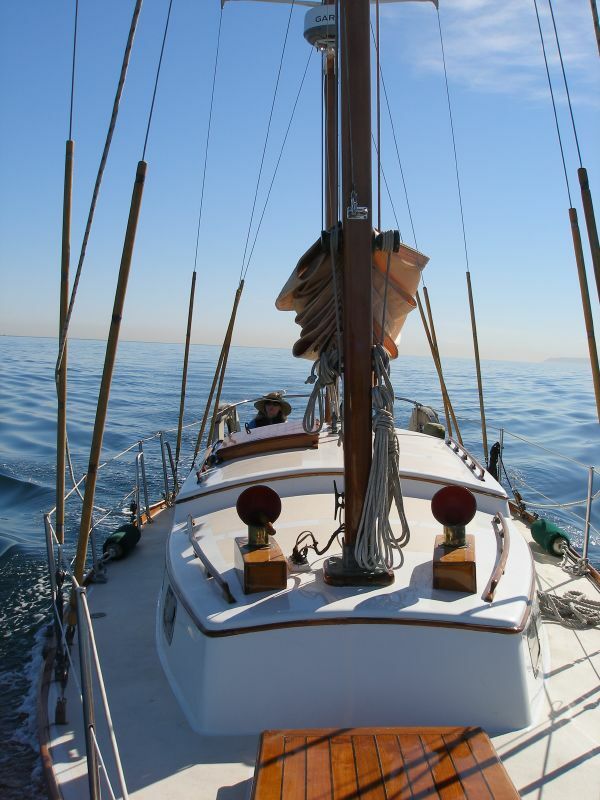 Unfortunately, by then it was Sunday afternoon so we just went for a short sail in Long Beach harbor. There was around ten knots of wind and we managed to get all the sails up and made a little over six knots on a beam reach. It was great to be done with the necessary modifications and to actually get the boat out on the water. We finally got under way on Monday, Jan 14th. We stopped at the pump out station to offload the ordure. I had to consult with some more experienced passers by. The poop sucker is a pretty simple machine but it was not a process that I wanted to go wrong. Wrong would be bad. Very bad. Aside from a bit of confusion about how to get ourselves out of the way of an incoming cargo ship, we got out of the harbor quite smoothly. 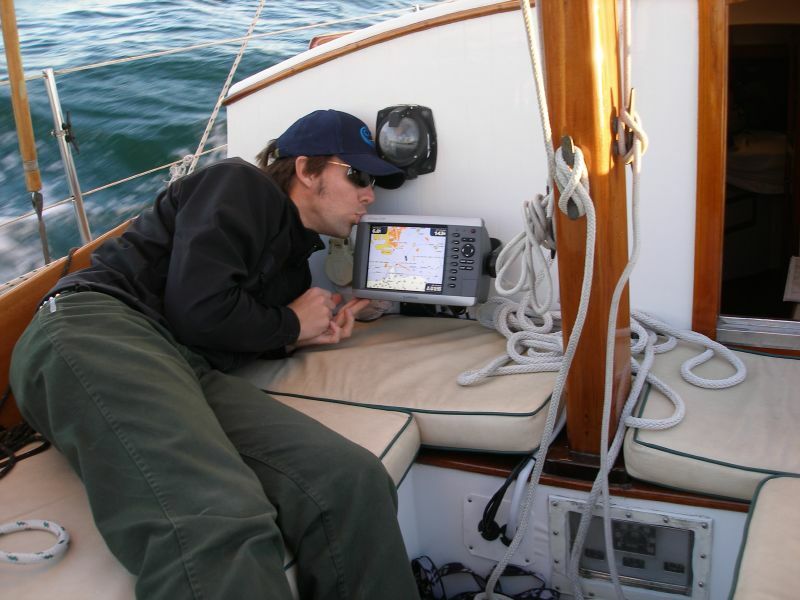 I squandered some time figuring out how to plot our course on the fancy Garmin 4208 chartplotter and then we just putted along on lovely calm and windless seas up to Marina Del Rey. It was warm and sunny and turned out to be the only t-shirt weather day we had on the boat. In the late afternoon, the wind even picked up enough that we were able to turn off the engine and sail for a couple of hours. Pretty damn nice. We left Marina Del Rey right at sunrise. It was a little colder but still great weather with very little in the way of wind. Out in Santa Monica bay we were accompanied by pelicans, big flocks of cormorants, and freeloading dolphins surfing our bow wave. I tried and tried but I just couldn't hit them with the boat. (I'm kidding, don't freak out.) 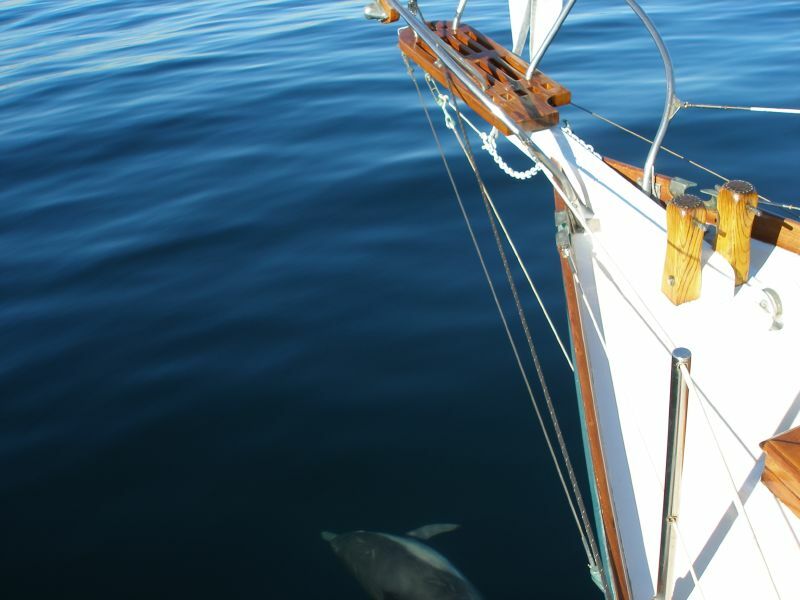 Actually, I tried and tried to get a a good shot of them under the bowsprit but the shutter lag on my digital camera made that pretty much impossible. The picture on the left was the best I could do. We had planned to spend the night in Channel Islands Yacht Harbor in Ventura but we heard on the radio that Santa Ana winds were forecast for the next day. Those winds gust hard offshore between Ventura and Santa Barbara so we decided to just keep on going and get up to Santa Barbara before the winds hit. On the one hand, we might have been able to sail instead of motor but, on the other hand, we didn't want our first sailing experience with this boat to be in 30+ kt gusts. So we kept going after the sunset past the oilrigs and up to Santa Barbara Harbor. Coming into that harbor at night was a bit scary. It was really difficult to see the navigation lights with all the city lights behind them. I was really glad to have the chartplotter working. We spent a day in Santa Barbara visiting friends, buy supplies and doing some minor jobs on the boat. The slip they put us in was right next to the entrance and bathrooms so there was a ton of people walking by. It seemed like just about everyone that came by had something to say about the boat. It was really flattering to have everyone tell us how pretty it was. On really nice old salty guy saw Christine working on stuff in the cockpit, looked at me and said, "You're a better man than me. I've never been able to find a woman who'll help me work on my boat." 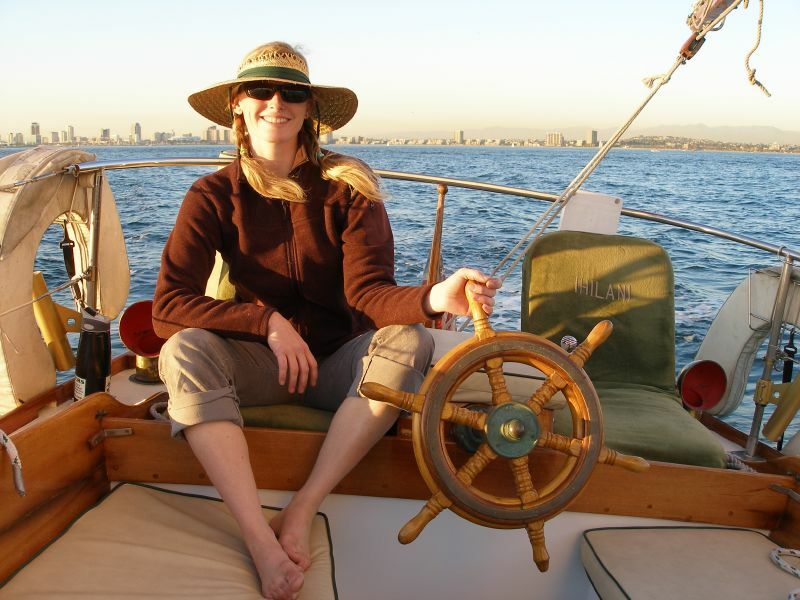 He went on to complement the boat and tell me I was lucky to have Christine to help me sail her. I agreed. As the day wore on, it actually started to get a little annoying to have everyone that walked by want to talk to us about the boat. We transitioned to working inside rather than outside but it was nice to know other people thought the boat was as pretty as I do. We checked out the weather and decided that the best time to go around Point Conception would be the following morning. Point Conception is a bit notorious for having foul weather and nasty sea conditions. With this being our first voyage, we wanted the easiest time of it we could get so we decided to leave Santa Barbara at 11pm to start the 20 hour trip up to Morro Bay. The Santa Ana winds had brought up a short period confused southeast swell that we took on our aft quarter most of the night. The trip from Santa Barbara to Point Conception actually ended up being the roughest ride we had. The masts swung back and forth across a wide arc of stars but the motion was as comfortable as could be expected and the boat behaved herself quite well. We made good time with the more or less following seas and rounded Point Conception as the sun rose. 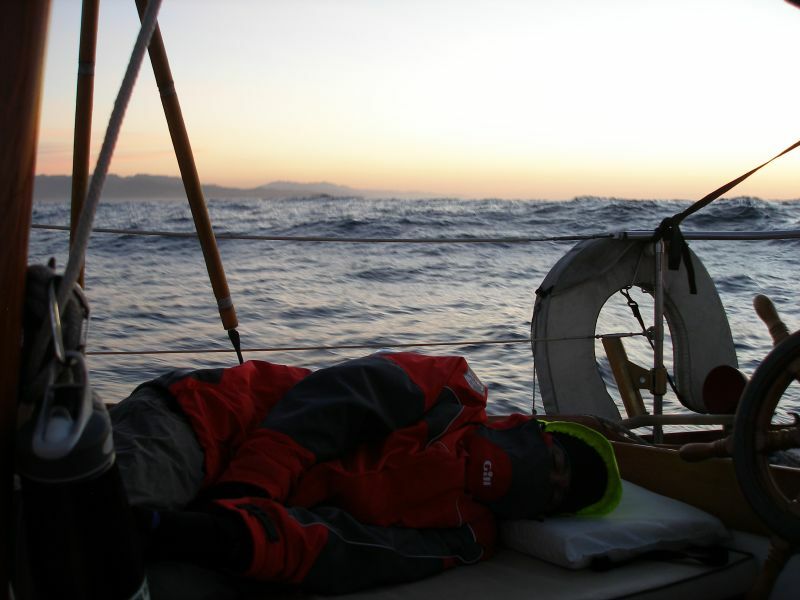 I did the first stint at the helm while Christine slept so I was only semi-conscious when we went around the point but even I could tell. The long period north swell took over and the annoying rolling stopped. The swell was probably around 10 feet but so far apart that the boat just gently rose and and fell. Taking the swell on the bow really smooths out the ride too. Much later, the wind picked up a bit out of the west north west as we approached Point Buchon. I almost drove my one woman crew to mutiny by rolling out the jib while she was sleeping in the cockpit. Despite the evil looks I was being given, I raised the mizzen too. I was having a good time and we were able to throttle back while still making the same speed but it was short lived and probably not worth the hassle which was Christine's contention from the moment I woke her. The sun was down when we finally got to Morro Bay. 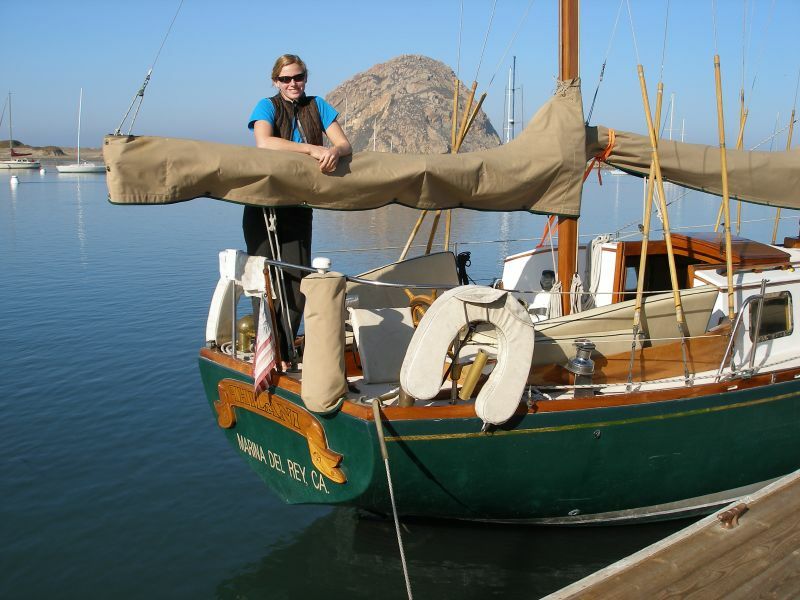 After a little confusion, we found the guest dock for the Morro Bay yacht club, figured out how to pay for the slip and went to sleep. We hung around Morro Bay until midday. We ran a couple of errands and then got ourselves connected to the wireless internet provided by the yacht club. We checked out the graphical weather forecasts and got an email with coordinates for the PISCO mooring buoys. PISCO is a consortium of research institutions that monitors the coastal ecosystem in California. I used to work for PISCO and Christine works for them now. They have a bunch of oceanographic monitoring devices on moorings up and down the coast. They knew we were making this trip and asked us to see if we could sight their buoys because a number of them had been torn up during the recent storms. I entered those points into our chartplotter and we were on our way. 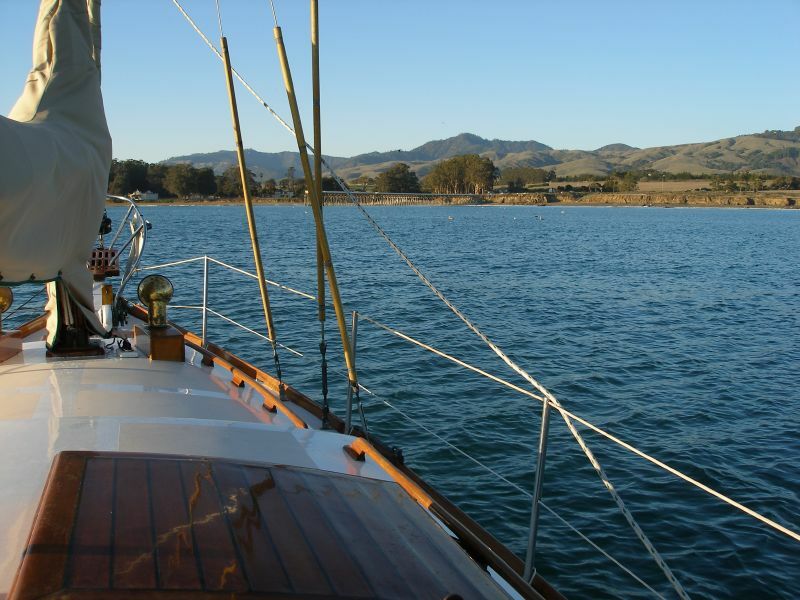 We got into the anchorage at San Simeon about an hour before sunset. Since we don't have a working depth sounder yet, we made a lead line out of a large shackle and some extra line. We found around thirty feet and dropped the anchor, set the anchor drag alarm on the chartplotter, and cooked some diner. Diner was followed by a nap - interrupted by some wind reversal induced anchor drag beeping. We weighed the anchor at around 9pm and headed north for the final leg of the trip up to Moss Landing. We took turns at the helm again through the night. We had a pretty tough time finding the mooring buoys at night. The night was cold but very calm. Still, it's kind of scary going into relatively shallow water (< 60 ft) and kelp at night. Still, we found most of them. The couple that we didn't find might have been there but we reached our comfort threshold for closeness to shore in darkness and stopped looking. After the moon went down, all the stars were out and our wake was glowing with bioluminescent algae. I was driving wrapped in my sleeping bag and about 14 layers of clothing. I put the feet of my sleeping bag over the dimmed chartplotter screen to better see the glowing ripples. I was cold and tired but glad to be the one at the helm so I didn't miss the show. We timed our departure from San Simeon so that we'd make Point Sur around sunrise. This timing gave us calm conditions for rounding the point (not as notorious as Point Conception but still thought of as a problem spot) and gave us some daylight to aid in the search for the Point Sur mooring buoy. The light definitely helped. It was one of the sketchier buoys to approach. It was in pretty shallow and surrounded by kelp. The kelp beds down there are predominately nereocystis (bull kelp) and fairly sparse in winter but you'd still rather not drive around in it. That buoy was actually really low in the water because there was a bunch of kelp wrapped around it. If we'd been there in the dark, I don't think we would have found it. Actually, I know we wouldn't have because I wouldn't have taken the boat in there. The rest of the trip was pretty uneventful. There was moderate swell but it was very long period and hardly even noticeable. The wind was pretty non-existent and both Christine and I have spent enough time on boats between Santa Cruz and Point Sur that the surroundings were familiar. 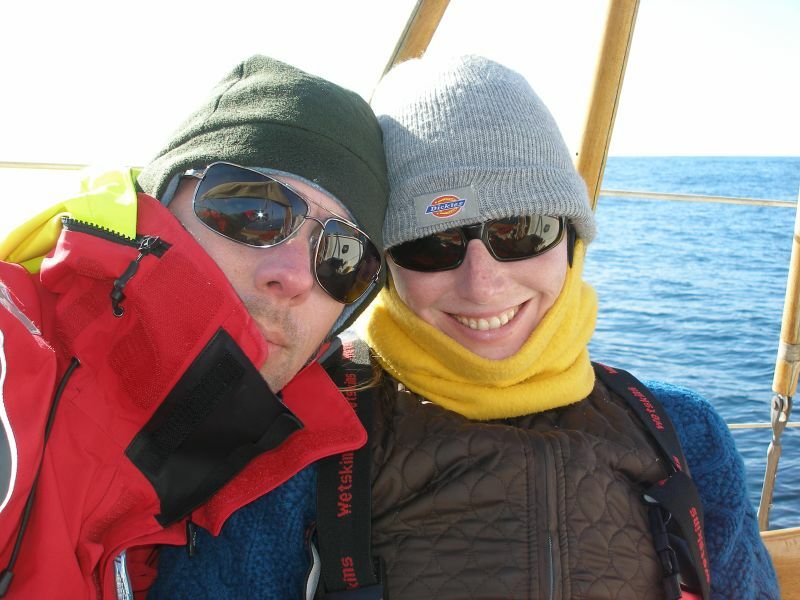 We made it into Moss Landing at around 3pm on Saturday, January 19th. The boat worked great. It would have been nice to be able to sail more but even with all the motoring I enjoyed the trip so much that I was sad that it was over.